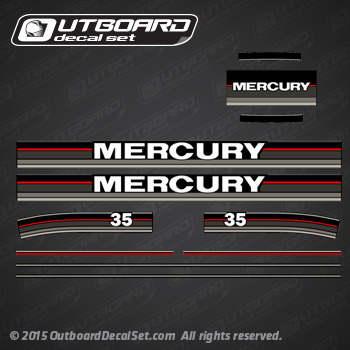 Mercury Outboard decals replica made for 1989 Mercury outboard 35 hp motor based on pictures, traces and measurements. 1989 MERCURY 35 hp MH-ALT: 1035203BC MH-ALT, 1035203BD MH-ALT, 1035203GD MH-ALT, 1035213BC MLH-ALT, 1035213BD MLH-ALT, 1035213GD MLH-ALT. 1989 MERCURY 35 hp MLH: 1035227 MLH. 1989 MERCURY 35 hp MH: 1035207 MH. 1989 MERCURY 35 hp EO: 1035302BC EO, 1035302BD EO, 1035302GD EO, 1035707 EO. 1989 MERCURY 35 hp ELO: 1035412BC ELPTO, 1035412BD ELPTO, 1035412GD ELPTO, 1035727 ELPTO.